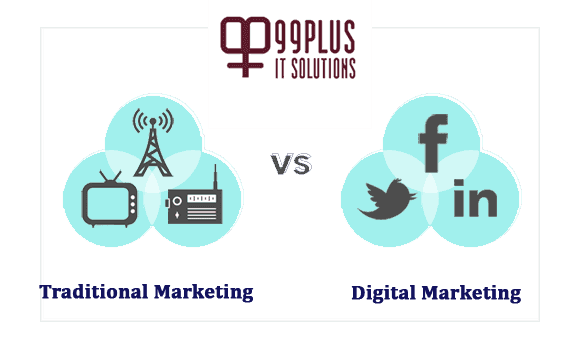 Traditional Marketing v/s Digital Marketing - 99Plus IT Solutions Pvt. Ltd.
Old & Traditional Method: Newspaper ads or pamphlets are used as a mode of marketing company’s products or services. These days’ people hardly take ads in pamphlets seriously. Updated & Digital Method: Social media channels (Facebook Twitter & Instagram) or search engines (Google & Bing) are used as the mode of marketing company’s products or services. These days almost everyone uses Google and almost everyone is available on at least one social media channel. More Time taking: Door to door distribution of pamphlets is done by the salesperson who almost covers half of the time in just distribution and even after that the company is not sure of how many potential customers were covered by that salesperson. Less time taking: Customers can be immediately updated with the latest products or services via social media or the internet. Companies can also keep track of the number of potential customers reached with the help of Social Media. Limited reach: Marketing is done manually so the only limited number of potential customers are covered. Only local customers get the benefit of the company’s products or services. Unlimited or Global reach: Digital Marketing is done on social media platforms or internet and it covers a large number of potential customers. Customers over the globe get the benefit of the company’s products or services. Companies reach the potential customers on their time for getting feedbacks. Customers can directly reach the company in their times of need instead of waiting for the companies to approach them. Companies get less updates on the ongoing trends as they have to reach each customer manually. Companies get regular updates on the ongoing trends via social media platforms and internet which helps them to understand what their potential customers are looking for in the products or services they offer. Not Cost effective: Traditional marketing is done manually so the company needs more employees to complete the task. This increases the budget of the company, which in turn increases the price of the product as well. The company loses its competitive edge due to this reason. Hence Traditional Marketing is not a cost-effective method. Cost effective: Company just needs to hire a right Digital Marketing Company/Agency for marketing purpose. With all the above points we can clearly understand the importance of choosing the right marketing method. With the help of Traditional Marketing, companies cannot gain huge profits and survive in the competitive market in this internet era. It was only possible when digital technology was not in the frame. In fact, companies stand a chance to lose its customer base because of the limitations of Traditional Marketing. With the help of Digital Marketing, companies can surely gain huge amounts of profit and not only survive but win in the competitive market in this internet era. Companies can increase its customer base on regular basis because of the reach of Digital Marketing. You can also consult (Free) us to know what kind of DM Services your company needs.